The first year of marriage is often considered the year of adjustment. As you celebrate this special 1st wedding anniversary, reflect on both the delicate and hardy aspects of your marriage and your love for one another. 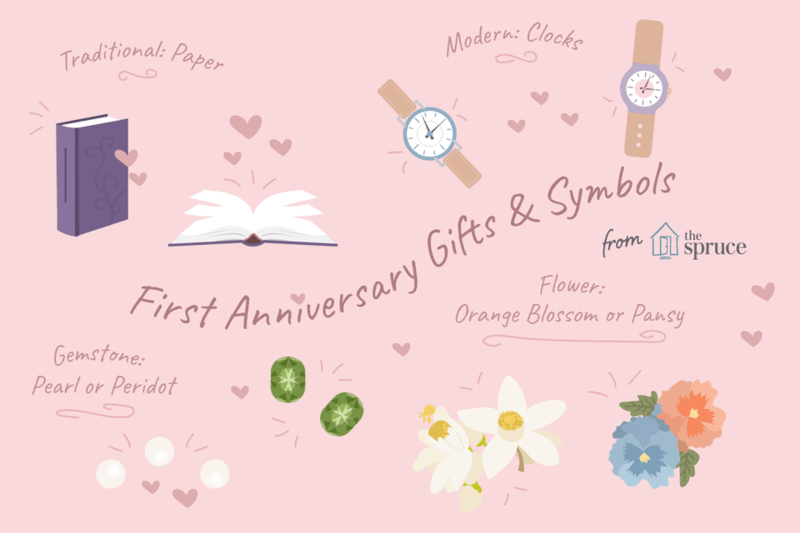 Here are some first wedding anniversary ideas and symbols to help you choose paper or clock gifts associated with your 1st marriage anniversary. Paper. It symbolizes the strength that comes from the interlaced connection of the paper's individual threads. Clocks. Henry Van Dyke wrote, "For those who love, time is eternity." Eat the top layer of your wedding cake. Purchase tickets for a movie, sports event, concert, theater, etc. to attend together. Plan a dinner at a special restaurant or plan a trip together. Plan a picnic with paper plates and cups. If you saved any of these items from your wedding reception, use them! Have a paper treasure hunt for your spouse. Leave clues throughout the house that eventually lead to a romantic location. Use paper flowers as a centerpiece for your anniversary dinner. Use the dried bouquet from your wedding. An anniversary journal to record your memories of your anniversaries throughout your marriage. You may think that you will never forget how you celebrated your anniversaries, but the chances are you will! Write down how you spent your anniversary together and what gifts you gave to one another. Purchase a framed share of stock in a major company that has meaning to the both of you. A roadmap describing a trip to take together. Stuff a pinata or pretty box with new paper money, confetti, a love note, book on romance, magazine, love coupons, paper flower, a picture of the two of you, etc. Create love notes and hide them. Print tickets for a movie night and watch your wedding video.